That’s a wrap on TCA summer press tour, which means that it’s time for one last story before I leave L.A.: a roundup of noteworthy developments from press tour, which reveal several new truths about the TV industry. Chief among them: Nothing is a ratings guarantee — except football. Somewhere in the vicinity of 100 shows were paneled at press tour, but as CBS president and CEO Les Moonves pointed out, “When you come back next year, not all of them are still going to be on the air. Even ours. However, this is a sure thing.” He was referring to Thursday Night Football, which is moving to CBS for the first eight weeks of the NFL season (after which it will return to NFL Network, where it has aired since 2006). As NFL commissioner Roger Goodell noted, “Sunday Night Football is now the number one franchise in all of television. 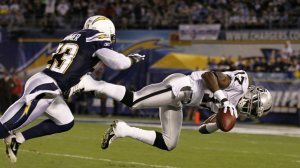 Not just in sports, but in all of television.” Sunday Night Football was indeed the top-rated show on TV last season, averaging 21.5 million viewers. CBS and Fox’s Sunday afternoon broadcasts draw a similarly-sized audience, while ESPN’s Monday Night Football averaged 13.7 million viewers. And the Super Bowl is always the most-watched program each year, with a record 112.2 million viewers tuning in last February. As such, Goodell expects that Thursday Night Football will be “the biggest thing” to happen on TV this season. There’s lots more about 3D TV, 4K TV, Hulu, Amazon, binge-watching, late-night and series based on comic books. Take a look; now that press tour is over, I’m going to sleep for several days! This entry was posted in News/Analysis, Quartz, Stories and tagged 3D, 4K, Al Michaels, binge-watching, DC, football, Geoff Johns, Hulu, Jill Soloway, Joe Lewis, late-night, Les Moonves, Marvel, Matt Stone, Netflix, Nina Tassler, Roger Goodell, Sean McManus, South Park, Sunday Night Football, TCA, The Late Late Show, Thursday Night Football, Transparent on July 22, 2014 by Jason Lynch. With yesterday’s news that Stephen Colbert will take over the Late Show next year, the long-held notion of what it means to be a late-night host, and what it means to be a late-night audience, has been forever eradicated. In 1992, your late-night options were Letterman and Leno, period. As of next year, the lineup will consist of Colbert, Jimmy Fallon and Jimmy Kimmel on the broadcast networks, along with cable hosts like Conan O’Brien (remember him? ), Jon Stewart and whomever replaces The Colbert Report. Late night is no longer all-or-nothing; it’s an all-you-can eat buffet. Thanks to the Internet, you can sample as many late-night clips from as many late-night shows as you’d like. In the piece, I trace late-night’s evolution and transformation over the past two decades, and how Letterman has changed from scrappy innovator to odd man out. 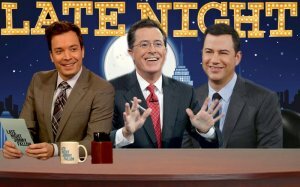 As Kimmel, Fallon and Colbert have proven time and again, “Late-night” is now late-night in name only. This entry was posted in Daily Beast, News/Analysis, Stories and tagged David Letterman, Jay Leno, Jimmy Fallon, Jimmy Kimmel, late-night, Pulp Fiction, Seth Meyers, Stephen Colbert, The Late Show, The Tonight Show on April 11, 2014 by Jason Lynch. Yet while Fallon has successfully maintained Tonight’s ratings dominance while drawing a significantly younger audience, his biggest achievement during his first month is online, where for the first time, people are viewing and sharing Tonight Show clips in massive numbers. His 10 most-watched Tonight clips on YouTube over the past month (from Feb. 17, the day of his first Tonight Show, to Mar. 15) have all garnered more than 2 million views. In contrast, only five of Leno’s Tonight Show clips have ever been watched more than 1 million times on YouTube. While Quartz is famous for its innovative approach to charts and graphs, very few of my stories lend themselves to including them. But for this one, I was able to contribute some of my very own, as I painstakingly charted the number of times Fallon’s, Jimmy Kimmel’s and David Letterman’s most popular clips had been viewed on YouTube. The numbers make one thing clear: almost immediately, Fallon has made the Tonight Show relevant online in a way it had never been before with Leno at the helm. And in the process, he has validated NBC’s controversial decision to give him The Tonight Show despite Leno’s continued reign atop the ratings. Fallon’s commanding numbers—both on TV and online—have ended (at least for now) any second-guessing that Leno was ushered off too early. Meanwhile, Fallon and Kimmel’s YouTube success illustrates a key way the late-night landscape has evolved since the early days of Leno vs. Letterman: it’s no longer enough of a coup to simply land a big star; you also have to do something unexpected with them. The majority of both Fallon and Kimmel’s most popular YouTube clips feature big stars doing unexpected things, as opposed to the standard talk show anecdotes that Letterman (and Leno) stick to. Until I did this story, I was shocked at Letterman’s meager online presence versus his time slot competitors. And congrats to Fallon on a first month to be proud of. This entry was posted in Favorites, News/Analysis, Quartz, Stories and tagged David Letterman, Jimmy Fallon, Jimmy Kimmel, Jimmy Kimmel Live, late-night, The Late Show, The Tonight Show on March 17, 2014 by Jason Lynch. But a notorious workaholic like Leno — who squeezed in 100 stand-up gigs last year in addition to his regular ‘”Tonight Show” hosting duties — won’t simply be putting his feet up in retirement. I suggest seven different networks that might be a good fit for him — and why. This entry was posted in Misc, News/Analysis, Stories and tagged CNN, Discovery, Fox News, History, Jay Leno, late-night, NBC, The Tonight Show, TV Land, USA on February 6, 2014 by Jason Lynch.